Stressing that Metro Manila’s water supply system was in much worse shape in the 1990s than today, former President Fidel V. Ramos lauded the Duterte administration and the current Metropolitan Waterworks and Sewerage System officials for addressing with dispatch the water shortage problem and for decisively putting on track major water supply projects for sustainable water security. MARCH CELEBRATORS. 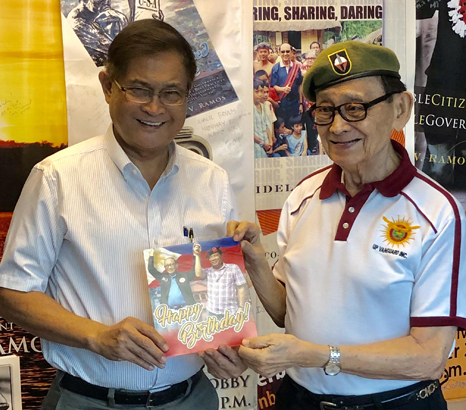 Former President Fidel V. Ramos and MWSS Administrator Reynaldo V. Velasco hold a ’Happy Birthday’ fan poster of FVR and President Rodrigo Duterte at the RPDEV Foundation in Makati. Both Philippine Presidents were born in March: FVR observed his 91st birthday last March 18 while President Duterte celebrated his 74th birthday on March 28. The MWSS chief visited FVR to brief the former chief executive on the actions undertaken by MWSS to solve the water shortage as well as the various water supply sources projects now in the pipeline for water security. Ramos made the statement following a courtesy call by MWSS Administrator Reynaldo V. Velasco—FVR’s first Special Action Force commander and veteran EDSA 1 and 2 hero including quelling coup attempts against President Cory Aquino—who briefed the former chief executive on the various executive actions undertaken by MWSS to solve the water shortage that affected consumers in the east zone concession area of Manila Water. Admitting that the MWSS is on a catch-up mode due to the failures of past leadership to develop new water sources, Velasco also discussed with FVR the short-term, medium-term and long-term water sources projects as well as the progress on the 600 million liters a day, P12.2-billion Kaliwa Dam under China official development assistance; the 500 MLD new Wawa Dam proposed by business tycoon Enrique Razon and Oscar Violago in partnership with Manila Water; the 1,850 MLD “ABC Projects” as well asthe 350 Laguna Bay projects by Maynilad and Manila Water. Angat Dam which supplies 96 percent of Metro Manila’s water supply with 4,000 MLD was built in 1967. The water privatization in Metro Manila began in 1994 with then President Fidel Ramos instructing officials to solve the water crisis in Manila by engaging with the private sector. Until August 1997, water services in the Metropolitan Manila were ran by MWSS that was saddled with myriad problems: 1) US$880-million debt; 2) non-revenue water equivalent to 69 percent; 3) antiquated infrastructure such as pipes and distribution systems; 4) inability to provide water to one-third of the households or 53 percent coverage; and, those connected to the service had an intermittent supply of 17 hours a day on the average, according to the MWSS. Under the concession agreement, Metro Manila was divided into two areas: the east zone ran by Manila Water Co., Inc. with 1,600 MLD allocation and the west zone, ran by Maynilad Water Services Inc.—formed initially by Benpress (Philippines) and Ondeo Water, a Suez subsidiary (France), until it was taken over by Manny Pangilinan’s Metro Pacific Investments in 2007 with 2,400 MLD allocation. According to Velasco, 22 years after the Public Private Partnership was started, water coverage is now 98 percent in non-revene water was reduced dramatically from a high of 63 percent to 11 percent by Manila Water and less than 30 percent by Maynilad. Velasco who along with his fellow Board of Trustees only assumed office in February 2017 reported that MWSS is back in the black as dividend remittance to the national government from 2017 to 2018 was unprecedented with P232.63M remitted in 2017 and P611.07 M in 2018, the highest remittance made by MWSS to the national government in its history. MWSS also settled a long-standing dispute with the Department of Finance regarding “Equity vs. Loans Payable to the JBIC Loan” issue by paying the total subject amount of P2.089 billion to the national coffers in 2018.